An adult, brown-banded cockroach is about 1 cm long, light brown with lighter drawings. This elegant insect began to appear in Northern Europe in the 1970s and has gradually become common. It requires heat to thrive, any temperature between 25 and 30 ° C will do. It can survive in dry places. The brown-banded cockroach is shunning the light and has a certain fondness of high locations in a room. That is behind racks, shelves, etc. 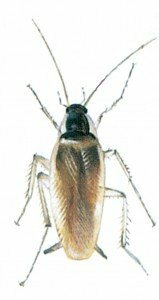 It is not uncommon behind TV sets, radios and other devices that give off heat and in some countries this beetle is actually known as the TV beetle. Egg capsules containing 10-20 eggs, are glued onto the insects’ usual hiding places and this process is similar to that of the Oriental cockroaches. 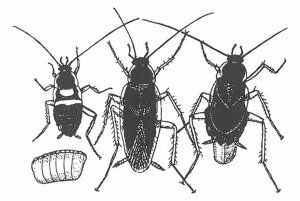 The brown-banded cockroaches’ offspring can therefore hatch long after the adults are exterminated.